Airplane Junkers JU 52 with 3 engines, premium, 908 pieces, Scale: 1:50, fully functional, made of high quality metal and high quality plastic material, Measurements app. : 41 x 57,8 x 11,5 cm, Wing span app. : 57,8 cm (! ), landing gear, 3 engines included, weight app. : 1,6 kg, 2 x AA batteries (not included) will be neded, all parts will be only fixed with screws and locked with nuts, equipped w/tools for assembling, instruction manual , recommended for age 12plus, packed in a gift box, from tronico. The JUNKERS JU52 airplane is modeled after its original fully made of metal. The scale is 1:50 and is screwed together from 908 single parts. It is fully functional. The 3 propeller engines are working fully functional. The weight of the airplane is 1.6 kg and thus provides a very detailed design. All parts are screwed together with nuts and locked individually. The material of tronico is made from high quality metal and plastic. 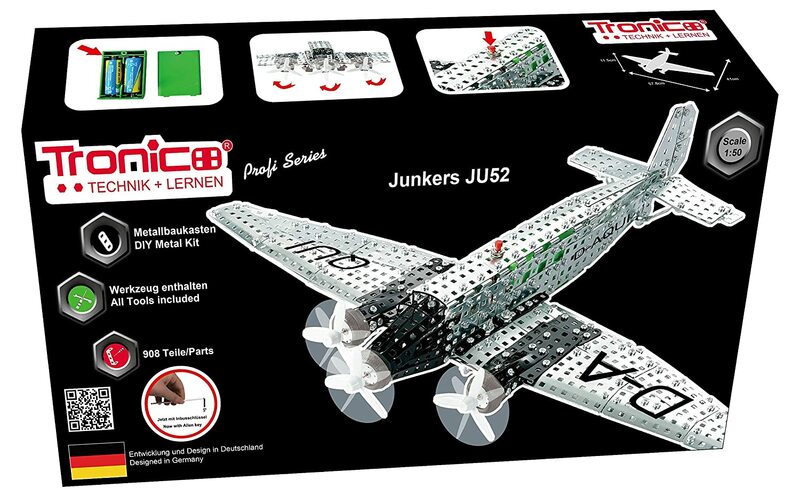 It comes supplied with a original stickers which after completing the assembled model makes it a true original JUNKERS JU 52 model made of metal. In the cardboard box next to the material you will find tools for assembly, assembly instructions and a colorful picture with control side views of the ready assembled product. We at tronico highly recommend the age of 12plus or at least with experience in metal kits.